June 18, 2011 Angela G.
My younger sister, back before she nixed meat from her life, was a die hard consumer of pork buns. Though she’s still a champion dim sum muncher, the title of pork bun king has been passed to my husband. Apparently, he’s been a connoisseur his whole life, and in that my sister can’t partake, the torch has officially been passed to him. And because he is truly the best ever, it was only a matter of time until I tried to make these bad boys for him. I did my homework and found a lovely (GORGEOUS) recipe for homemade pork bun dough from master Chinese recipe writer, Andrea Nguyen. And then I got a little sleepy and put off making it from scratch. After roasting the pork myself and making the savory, sweet filling, I thought I owed myself a break. What of some pre-made dinner roll dough? I could still lacqueur it with a delicious glaze before chomping away? Well, kiddos, although the buns are not a permanent substitute for the real thing (and homemade dough for that matter), they are still addictively good. Plus, their smaller size makes for rapid-fire eating. Consider adding these to your next cocktail party menu, or make a selection of dumplings and include these babies for a little home dim sum party of your own. I’m sure my husband will find his way over to your house to indulge. This recipe makes enough roast pork for 16 buns, with pork left over. Consider using the rest of the pork sliced up for a delicious udon noodle soup or diced in fried rice. Or eat plain with some sesame cucumbers. Begin by making the roast pork. Mix the barbecue mix with the water and sesame oil. Toss the pork in the marinade and let rest overnight. Preheat the oven to 450°. Line a baking sheet with a wire rack and place pork on top. Roast the pork until barely cooked through, about 15 minutes. Let cool. Chop pork finely with a knife or in the food processor. Heat a skillet over medium heat and add the sesame and vegetable oil. Add the pork, white pepper, brown sugar, soy, oyster sauce, sherry and scallions and cook until fragrant, about 2 minutes. Mix the water and cornstarch together until smooth and pour over the pork. Stir until thickened and then taste for salt. Let cool. Cut the roll of dough into 8 pieces. Flour a board and rolling pin, and roll each piece of dough into a 3in wide circle. 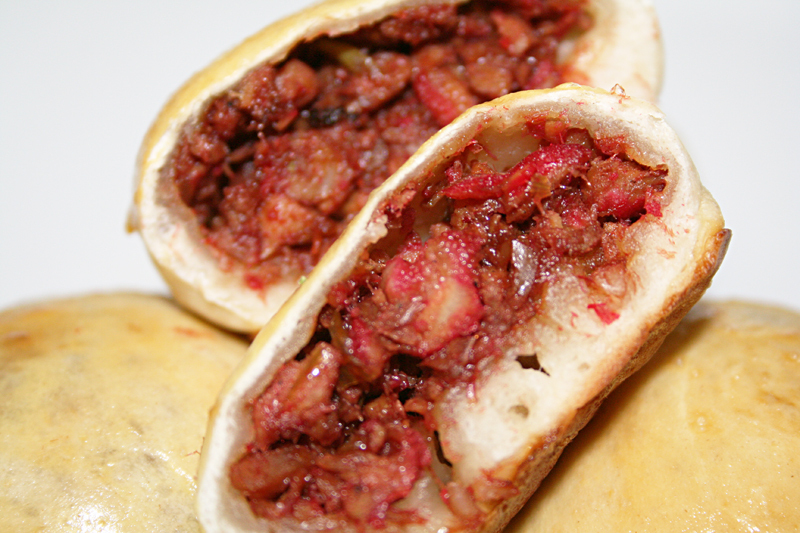 Add a heaping tablespoon of the pork filling to the middle of the dough. Pinch the dough together in the center. Place the bun, pinched side down, on a cookie sheet lined with parchment paper. Repeat with the other buns. 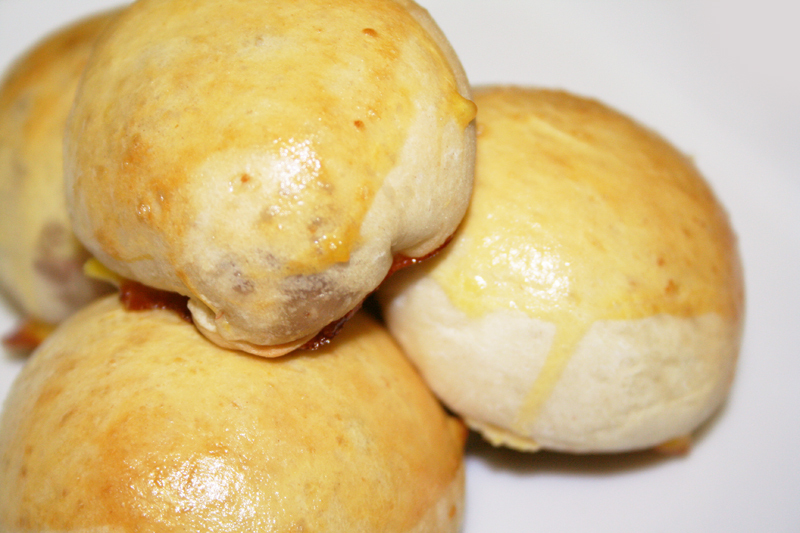 Brush the buns with the beaten eggs and bake in the oven on 350° for 15 minutes. Remove from the oven and while hot, brush with a mixture of honey and water. Serve warm.